Star Wars Celebration Europe 2016, an extravaganza of all things Star Wars, is going strong on its second day in London. 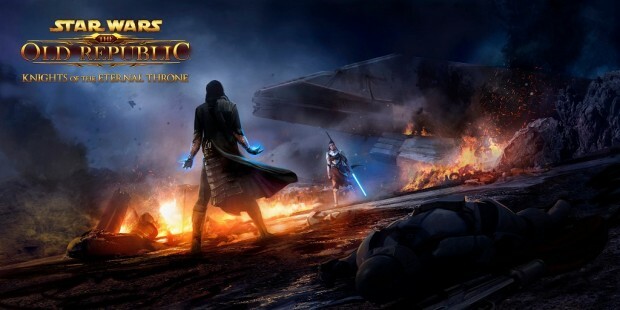 It was from the convention’s prominent main stage — hosted by Warwick Davis, even — that Star Wars: The Old Republic Director of Design James Ohlen made the announcement of the next expansion for the game, Knights of the Eternal Throne. Then, at the end of the trailer, there’s the Knights of the Eternal Throne teaser and the promise that it would be out in Fall 2016. There’s not much to go on besides a title, though it seems reasonable to assume that it will continue, to some degree, the storyline from KotFE; whether it follows the same episodic format as its predecessor or is more of an “all-in-one” expansion still remains to be seen. The webpage for the expansion is similarly information-light, but you can check it out and sign up to receive regular news updates. All the scrubs are commenting. You spend money on booze, smokes and junk food, but a monthly sub? Noooo. Scrubs. Most of this game’s content is locked behind a paywall, Don’t bother, people. What a brainless company, they work for food and tryiong to revive this dead game, WAKE UP no one going to support scammers, its a fake free to play game wityh locked content and characters, you can try this poop, u hardly find any alive person online there! And… the award for the worst troll and idiot goes to…. DING DING DING. You. What is the point? If they want a story based game, just make a new star wars game, make it single player, and make it a lot more interesting. They’re literally just trying to sell us a Star Wars skinned World of Warcraft, with all the fun parts of WoW stripped (story, setting, gameplay, endgame) with the SW universe and extremely mediocre everything with a decent story. I seriously don’t understand why they don’t just make a single player game instead, a story driven MMO without endgame content makes zero sense. I don’t know what game this person is talking about. They are making single player star wars games by different developers. This is Bioware’s game and they want it to be an MMO with an amazing story that is also an MMO with MMO features. SWTOR honestly does what no other games do and that’s make a Story that you can immerse yourself in but can also experience with other people and add a dynamic element, and have whatever fun along the way. I tired this game with 80% of all this stuff content locked including stories its not worth it.. not gonna spend $100 of dollars each month for only 1 day worth of fun.. Hold on Billy, that’s 15$ not 100. The game is NOT dead dont bs ppl! Fake f2p game,Locked content and characters, thats why its dead long time, no one like scammers! 2. Try to sub, it will make everything way better.